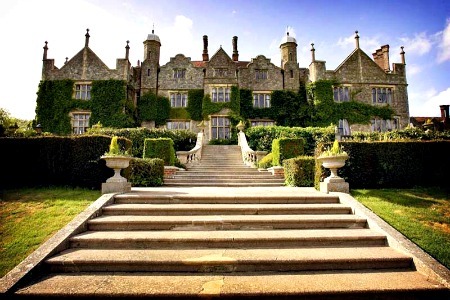 The current building of Eastwell manor was built between 1793 and 1799 for the 9th Earl of Winchilsea, George Finch-Hatton, in the Elizabethan style. The original country house of the at Eastwell was built between 1540 and 1550 for Sir Thomas Moyle, and interestingly enough a man named Richard Plantagenet, who was one of the bricklayers employed on the estate was thought to be an illegitimate son of Richard III. The Eastwell estate has always been home to very upper class residents, and after the 11th Earl of Winchilsea ran into financial difficulties during the 1860's, it was passed onto the Duke of Abercorn. Next it was occupied by the second son of Queen Victoria, Prince Alfred Duke of Edinburgh. During the time Prince Alfred held the estate, Queen Victoria was a regular visitor here, with there being photographs of her ice skating on the lake. In 1875, Prince Alfreds daughter was born at the house, and she later went on to become the queen of Romania. Her memoirs include a passage about the estate and it reads as follows, "beautiful Eastwell with its great gray house, its magnificent park, with its herds of deer and picturesque Highland cattle, its lake, its woods, its garden with the old cedar tree which was our fairy mansion." The house was almost completely destroyed by fire in the 1920's but was fully rebuilt on the same site within a few years. After many changes and heavy renovations the manor is open today as a luxury country house hotel, while the rest of the estate is used as farming land. The hotel is thought to have only one resident ghost, and she is known as the "white lady". Who she is or why she's there seems to forever remain unknown, but there are tales of her being present in the building for at least 50 years. She is seen on a regular basis by the night porters of the manor, with her being described as a woman in a white dress and long black hair, with her face being covered in shadow and her features impossible to make out. Though she is thought to be a friendly ghost as she has never acted aggressively or caused any mischief around the manor, instead she is only seen to walk through the hallways, staring at the floor before fading away into nothing after a few steps. She is also believed to be responsible for the strange noises which can be heard throughout the building. Footsteps coming from the insides of empty rooms and echoing down corridors were no one living is present. As for other spirits in the manor they are thought to come from the village of Eastwell itself which has been classed as a highly paranormal place for some time now. One of the spirits who visits the estate is that of a horseman who has been seen riding at some speed towards the house, only to quickly change course and ride towards the lake close by, only to disappear before hitting the waters.